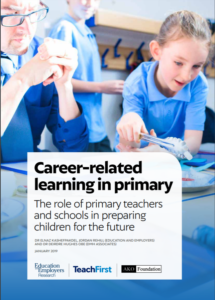 A new report ” Career-related learning in primary: The role of primary teachers and schools in preparing children for the future” has been written by Dr Elnaz Kashefpakdel and Jordan Rehill both from Education and Employers and Dr Deirdre Hughes of DMH Associates. This paper, commissioned by Teach First, provides evidence on the benefits of career development activities for children in the primary phase, and the range of teacher roles when delivering it. In doing so the research attempts to map what primary schools are doing to tackle the influence of socio-economic issues that affect children’s future transition to secondary school and beyond, how they approach career-related learning and how we can get a step closer to ensure best practice in primary career provision. Today’s report sets out examples of good career-related learning, despite challenges such as finding space and time in the curriculum to provide opportunities to learn about the world of work. The report identifies that an essential ingredient for successful primary schools is buy-in from senior leadership. It recommends that primary schools should develop an approach to career-related learning that enables students to engage progressively in a wide range of experiences of transitions and the world of work. Children should have encounters with the world of work from the age of 5 to see the connection between what they learn and what they might want to do in the future.